I installed this program to try it out, and didn't like the effect, so I ran the uninstaller. It refused to uninstall, something about 'C:\AeroGlass\uninst000.dat' not existing, so I forcibly deleted the C:\AeroGlass folder, as well as the task in the Task Scheduler. However, after restarting my computer, I found that the Start Menu was completely broken, pressing the button does nothing. Cortana and the Timeline view also cease to work, and I can no longer open any default Win 10 'metro' style apps like the default Photos app. I have a single restore point which takes me back to before I forcibly deleted AeroGlass, and returning to it restores Start Menu functionality. After much troubleshooting I found that the issue lies in deleting the 'DWMGlass.dll' and 'dbghelp.dll' files under C:\AeroGlass. If either of these are deleted, the Start Menu breaks. 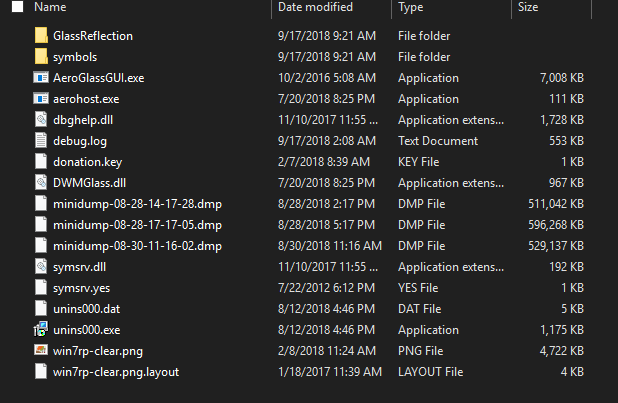 For a little while I lived with just those two files sitting in that folder, but when the new Win 10 update came along, it completely broke my Start Bar functionality, even when those files were there. TLDR; AeroGlass has completely trashed my Start Bar functionality with any attempt to uninstall it. Does anyone know how I can get rid of this program without ruining my Start Bar? This will sound odd, but reinstall AeroGlass. Inside this folder should be like the picture I attached. If the uninst000.dat file is there, try to uninstall normally or just run the uninst000.exe file directly. On the start menu issue, try googling 'repair win10 start menu' . I have had to do this in the past, and usually find a owrk around to repair it. CarteNoir: I suggest to run "regsvr32 /u DWMGlass.dll" from command line (as admin) before uninstalling.